Mumbai: It will be difficult to meet the fiscal deficit target this year even as the government sticks to its aim of bringing it down to 4.6% of gross domestic product (GDP), Kaushik Basu, chief economic adviser to the finance ministry, said on Tuesday at an international banking summit in Mumbai organized by Yes Bank Ltd and Financial Times. He also said a roll-back of the fiscal stimulus may not be advisable at this juncture as even developed countries are going slow in doing that. “We are still sticking to the 4.6% fiscal deficit target, though it looks difficult. But we must also understand that the industrial countries are going slow in reversing the stimulus because there is a recessionary tendency all over," Basu said on the sidelines of the seminar. The government has overshot its second-half borrowing programme by Rs52,800 crore, 32% higher than what it had initially planned. The hike in the borrowing programme has factored in a shortfall in small savings mobilization. However, given that the economy is slowing, it is almost certain that the government will not be able to meet its revenue target and, hence, it will have to come to the market again with higher borrowing plans to bridge the gap between funds and expenses, economists said. The finance ministry is working in the same direction as the Reserve Bank of India (RBI) to curb inflation, but their pace may not be the same, he said. In its latest quarterly policies, RBI has criticized the lack of government support in containing inflation that has been persistently high for about two years now. “Questions can be raised on whether the Reserve Bank is moving faster than the ministry in curbing inflation. 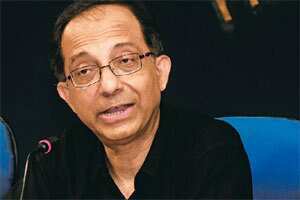 The fact is, both are moving in the same direction in cutting back to fiscal consolidation," Basu said. He is hopeful that foreign direct investment (FDI) in retail will materialize soon, even as there is resistance from different quarters. “FDI in retail has been stalled now, but we have managed to rope in various sections of the government, including a secretaries’ meeting. It’s stalled for now, but not too long... But there is still a multiplicity of public opinion... We have our fingers crossed." According to Basu, the continued depreciation of the Indian rupee is putting pressure on the government, but this is beyond its control. Money is flowing into the US treasury due to the global turmoil, strengthening it against all currencies, including the rupee. “There is a feeling that the rupee’s decline is a fluctuation and not a trend. For a movement of the kind we have seen, what the Reserve Bank of India is doing is exactly right, which is to do nothing," he said. The rupee ended close to a 32-month low of 50.66/67 to the dollar on Tuesday, 0.7% below the Monday close of 50.285/295. It hit 50.76 during intra-day trade, its weakest since 31 March 2009.